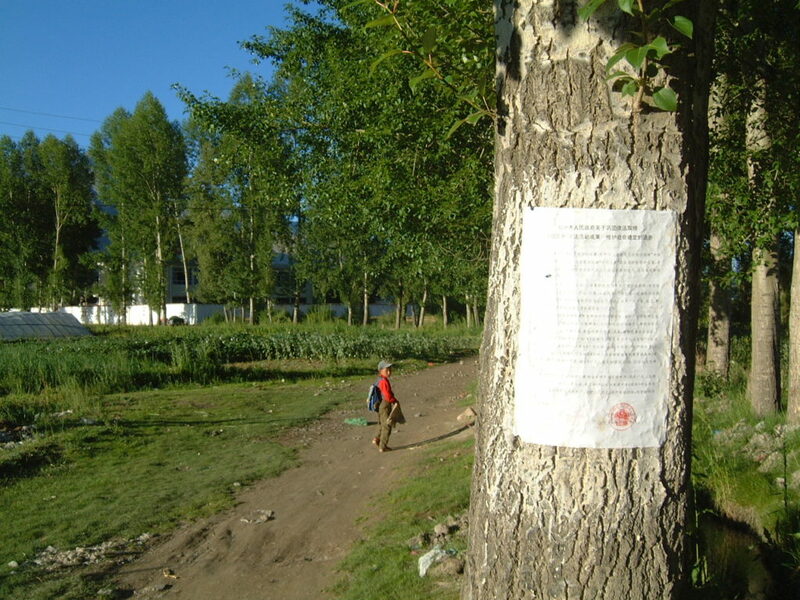 The ban order attached to a tree in Trunglha Village (Photo taken by Wang Lixiong on July 6, 2001). The blogpost was written by Woeser on the birthday of the Dalai Lama this year and the theme of the post is also this birthday, traditionally celebrated in Lhasa with a festival known as “Trunglha Yarsol”. “Trunglha” (འཁྲུངས་ལྷ་) is Tibetan and means the deity of birth. According to research, during the time of the seventh Dalai Lama, in a lush wood on the south-eastern side of Lhasa, a shrine called “Trunglha Lhakhang” was built to worship the deity for the birth of the Dalai Lama. This is why the place of the shrine became known as “Trunglha”. Traditionally, on the birthday of the Dalai Lama, the government and the people would hold grand celebrations at this site: they would perform incense rituals, burn incense, chant, pray and throw tsampa to display and send out good wishes. People from all corners of Lhasa would come out, jubilate, throw tsampa on each other and sincerely pray that the “Dalai Lama would always be on this earth” as well as for the “Victory of the Gods”… This joyful celebration was commonly referred to as “Trunglha Yarsol” and has a history of over 300 years. In 1999, this traditional festival was once again cancelled, after it had already been cancelled once in 1959. Also, the Trunglha Village was renamed into Tamar Village, which means Red Flag Village. 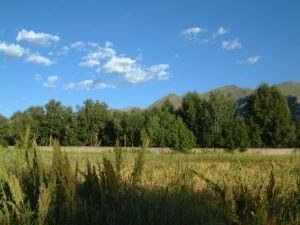 Its full name has since been Tamar Village, Najin Township, Chengguan District, Lhasa. 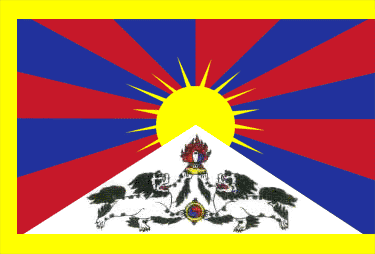 At the time, the “Tibet Daily” reported on it like this: “…From the beginning of the 1980s, the ashes of the illegal event called ‘Trunglha Yarsol’ burnt once again, after it had completely vanished during the democratic reforms….many officials, workers and laymen showed their deepest resentment against this illegal event and strongly called for the People’s Government to ban it. In 1999, after the government prohibited this illegal event, the villagers devoted all their energy to economic development, began to open hotels, farmhouses, flower and plant markets, sand and stone markets and other businesses. The people unanimously requested the former dishonourable name of ‘Trunglha Village’ to be changed into ‘Tamar Village’. ‘Tamar Village’ is Tibetan and means ‘Red Flag Village’, the villagers’ wish was: ‘to wholeheartedly follow the CCP and live our lives prosperously’. The original site of Trunglha Lhakhang. What is important to add is that the original location of Trunglha Village has already disappeared, because that is where they built the new campus of Tibet University. As for the original villagers, they have all been evicted and moved to a new place called “Tamar Moderate Prosperity Model Community”. Official media celebrated villagers for having moved from “poor to a rich” lifestyle in happiness. The Village Branch Party Secretary deployed official jargon to state that the “formerly poor and backwards ‘‘Trunglha Village’ has today turned into a civilised and rich ‘Red Flag Village’”.